I suppose that with any collection, there are things which a collector may be more or less interested in, depending on their point of view or their likes / dislikes at the time. I think that sometimes, those initial biews can change. I know this is the case with me, anyway. 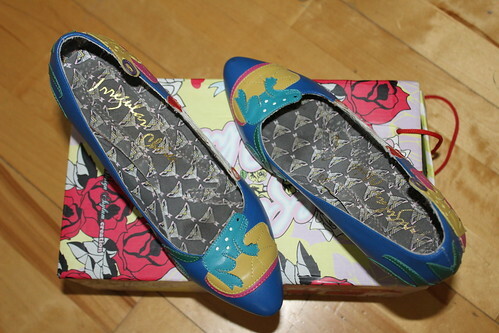 Often, with each new season of releases, I will have a look at the new Irregular Choice offerings and decide which of the new styles I really like and would therefore like to add to my collection. 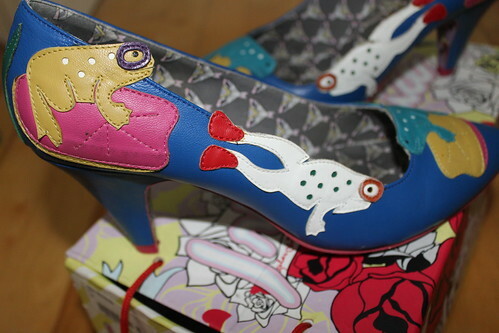 Frog Princess were released in the SS09 collection and at the time, due to the pointed front and the shorter-than-average heel, I sort of overlooked them. Since then, however, my view of them had changed and they were one of those pairs which I decided I would like to get my hands on, after all. I was pretty lucky to find a pair in blue, which is probably my favourite of the colourways. I paid £12.50 for these on eBay and am totally thrilled with them. 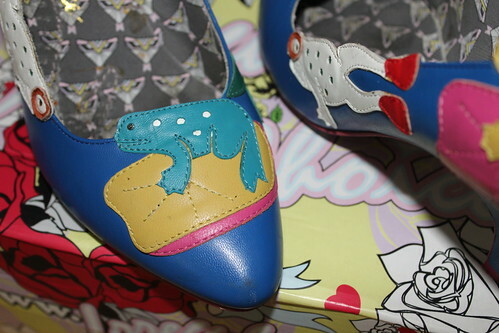 These are in rather fab condition and I really like the fact that the colourful frogs seem to be wearing goggles and flippers. Awesome. The little white froggy is rather cute. Will keep an eye out for pink parrots. What size? Boo, I can't believe I missed the end of your giveaway. they are just that little bit different to ICs these days, aren't they? I mean, I like the perspex heel and all, but they do seem to use it on EVERY shoe lately.